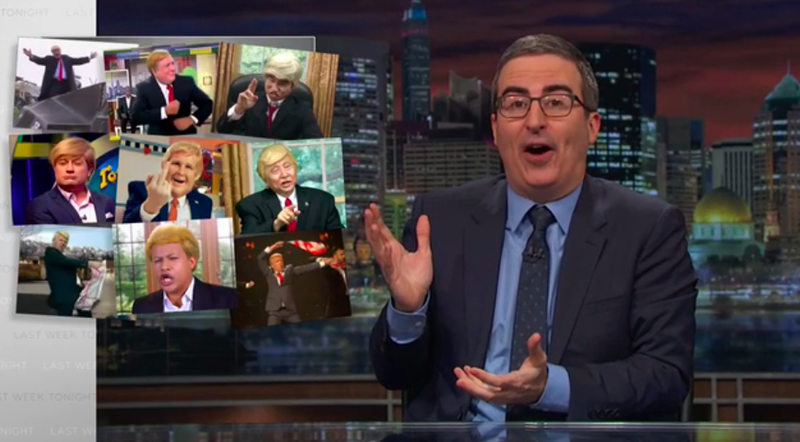 Oliver, after playing clips of then-candidate Trump promising to get the rest of the world to stop laughing at us and stuff, deployed a montage of international comedians in bad Trump wigs (so, Trump wigs) mocking the hell out of him, and us. Oliver also brought back his gift for deceptively hysterical analogies, likening Trump’s promise of a return to dignity to “a flamingo in boxers named Phineas J. Rocketdump” running for president on a “Make America Respected Again” platform. (Nice to have you back, sir.) But for a more substantive examination of just how Donald Trump’s loose lips, racist insults, State Department neglect, and general clownishness have diminished not just America’s standing, but our position as world leader, Oliver mixed laughs and depressing reality with his wonted aplomb. But Oliver, even when things are bleakest, tries to leave everything on a note of both humanistic hope and deep, abiding irreverence. So here, he closed out with an appeal for Americans and the rest of the world to look past our embarrassment-in-chief and recognize the inextricably bound excellence and ridiculousness of our great nation. Just as the quintessentially American invention YouTube brings us racist, braying little twits and awesomely goofy videos of people in T. rex costumes alike, Oliver brought out the New York Gay Men’s Choir to sing a truly lovely, even touching version of a particularly terrible, uniquely American song. While he was simultaneously tucked into a Batmobile bed by adult humans in dinosaur suits, Oliver created a tableau that sums up our—and his—mission going forward: Embrace our contradictions, strive to be better, mock the worst of us, and never forget to be profoundly silly at the same time.